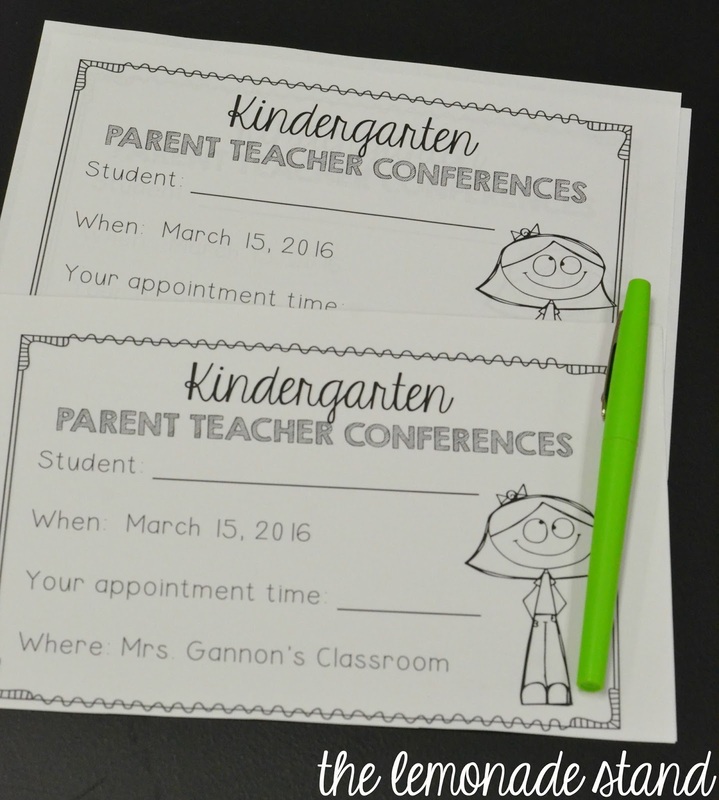 Parent teacher conferences are coming up for me next week. Therefore, I have been planning this past week and scheduling conferences with parents. 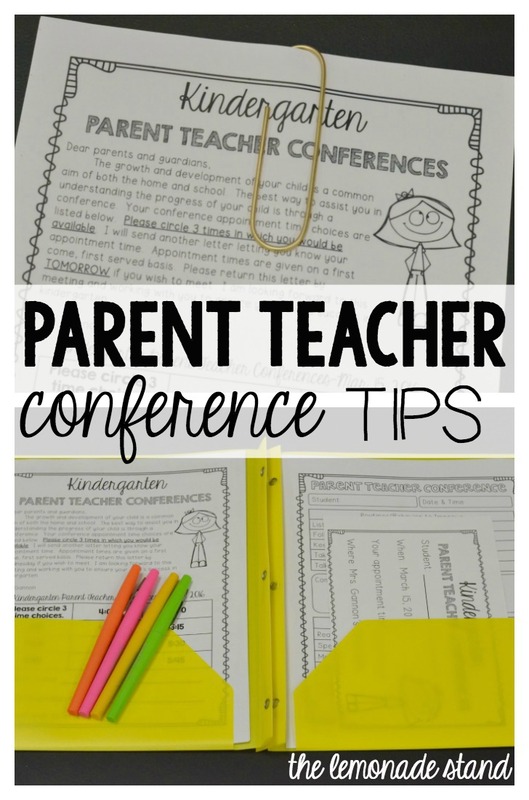 I have used this system for planning conferences for a few years now, and it is just what works for me. In our district, we have a fall and a spring conference. It is scheduled from 3-6:00 p.m. for only one night. 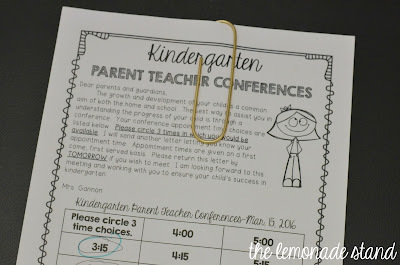 I usually have around 20 students, so it is always very difficult for me to schedule all of the parents and be allowed to fit everything in that I want to discuss in such a short amount of time. So, planning ahead is super important for me! This is the folder I use to hold the copies of my planning documents for conferences. The letter I send home is on the left and appointment and conference notes are on the right. I keep important assessments given, along with ESGI results from each nine weeks in a folder for each student. 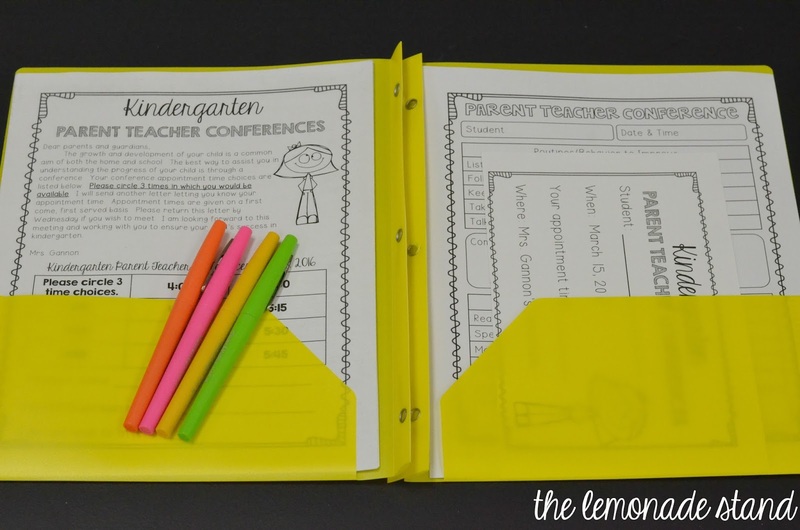 This is also the folder I use to house their report cards. I send these home each quarter, and this time it fell one week before conferences, so it worked out to send the conference invitation letter inside. I schedule 15 minute slots. I am very flexible with parents, so if they cannot come that night, we may meet at another time. I also teach at a Title I school, so not all parents want to attend conferences as much as we would like. Some parents prefer phone conferences. I wish I had more time to conference with my parents, but we make it work. Parents choose three times slots that they prefer. I then send home an appointment note stating their given time. I jot down the times on my clipboard; once I am finished, I will type it up. Parents sign that copy of the schedule for my documentation. I always highlight the time they chose on the letter just in case and keep those for my records. Since my time with them is so short, I plan very precisely what we are going to talk about. I know I have to stay on schedule because I have another appointment usually immediately following the current one. 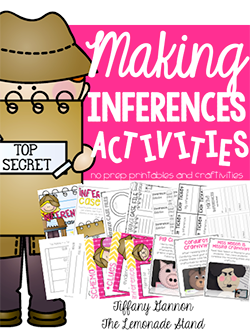 This printable below has become a lifesaver for me! This is the one I use for kindergarten. 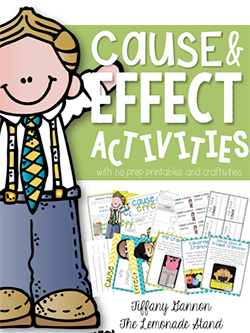 It is very general, but it covers social, emotional, behavioral, and academic needs. I like to write my notes before the meeting in one color and use a different color as I write notes during the actual meeting. This helps me keep track of what the parents said. 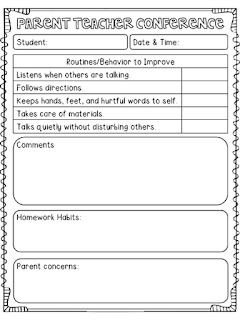 The form below is the one I used in second grade. 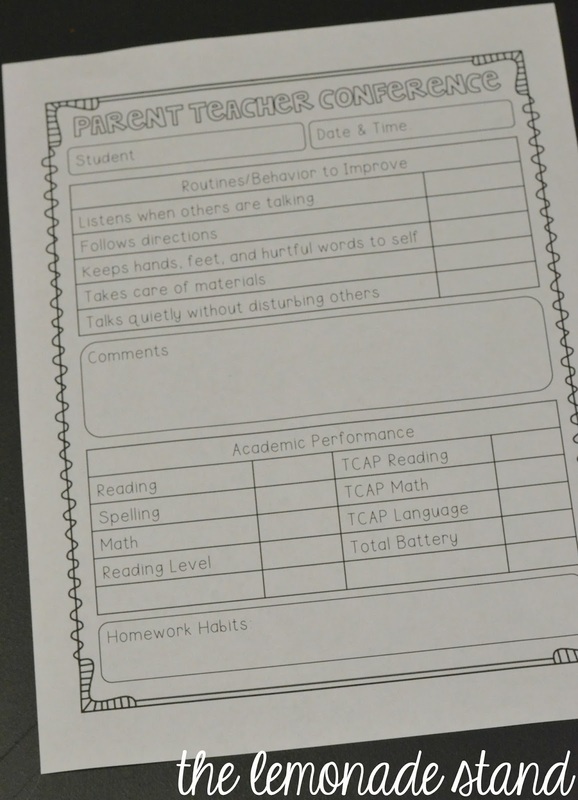 We had much more data at that grade level to include than in kindergarten. 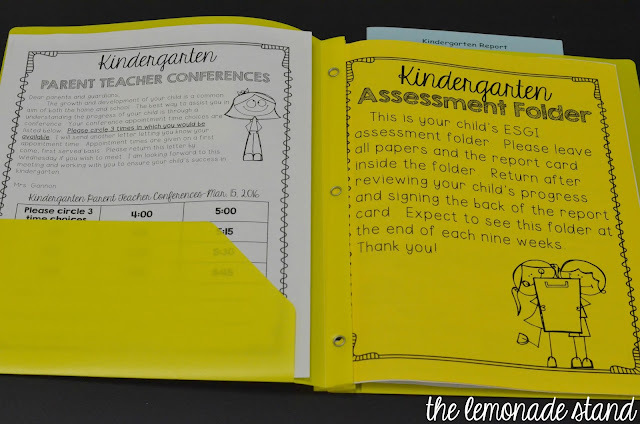 As far as data goes in kindergarten, I refer to their DRA results and their ESGI reports in the assessment folders. I always like to include strategies, games, websites, or any other resources that would be helpful for students by sending home something specific with parents. They always want to know what they can do at home to help their child, so always have something to give them. 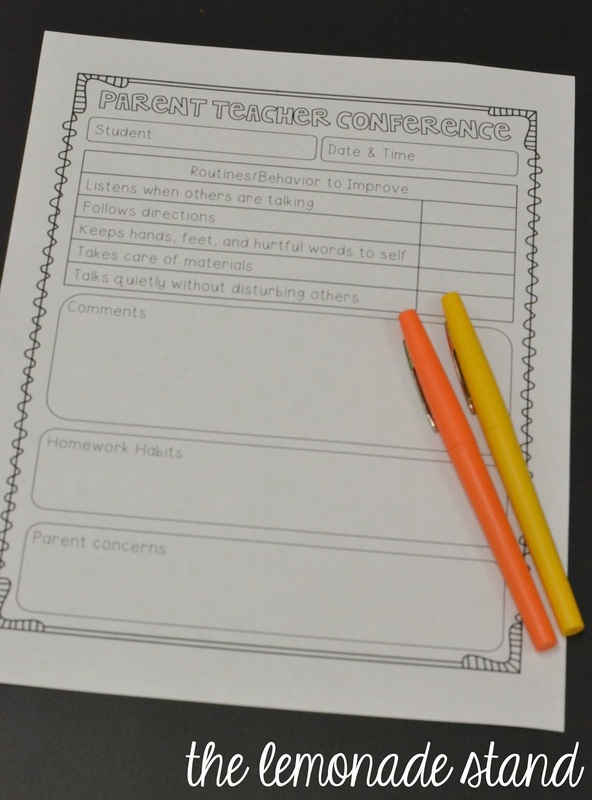 You can download editable versions of my parent teacher conference documents below. 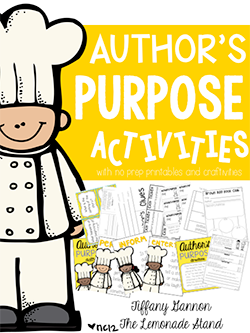 I used KG fonts and Cara Carroll Fonts, so you will need to download those in order to match the fonts. 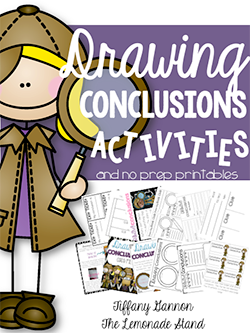 I hope these resources were useful to you in some way. 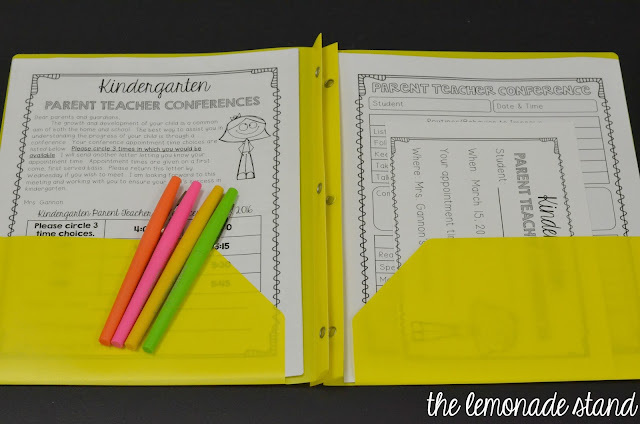 I know when I first started teaching, I did not have anything like this to really keep me organized and on track, so hopefully this will at least be somewhat beneficial to new teachers. How do you prepare for these meetings and how is yours structured? 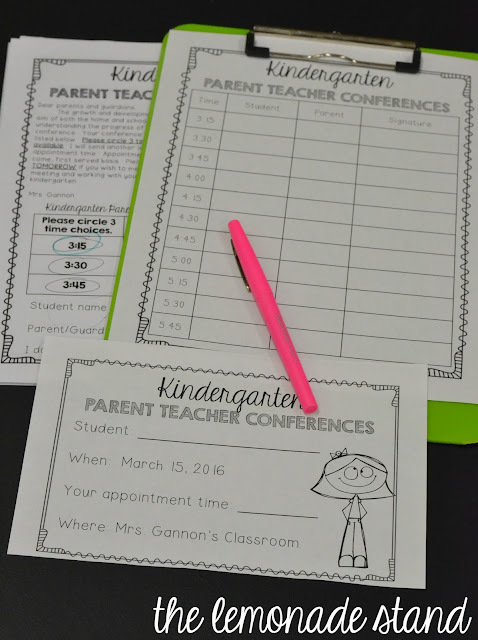 I would love to hear your fun ideas for parent teacher conferences!